To make a form appear on your website, select it in the “Patient Forms” area of the “Practice Locations” section. Your forms must be in Adobe Acrobat PDF format. 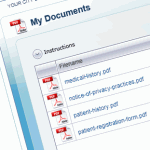 The “My Documents” section is where you can upload your own patient forms or other documents you’d like to make available on your website. We’ve provided generic forms that you can customize in Microsoft Word. Just click “Download” to save the file to your computer, then edit it and add your custom practice information. All of your forms MUST be uploaded in Adobe PDF format. There are a lot of ways to make PDFs, but one of the easiest ways is to use Microsoft Word. In some older versions, there is a “Print to PDF” option. In the newest version, all you do is click “Save As…,” then select “PDF” from the drop-down list. Since it’s an online form, we don’t want the file size to be too big, so we’ll select “Minimum size (publishing online).” Click “Save,” and boom – you’ve created a PDF.